Master Shu Chin Hsu, RN, is a disciple and a Worldwide Representatives of Master Zhi Gang Sha’s. She is also a certified Divine Direct Soul Communicator. She is a graduate of the most advanced certified teacher and healer training programs of the Institute of Soul Healing and Enlightenment™. She has been trained rigorously with Master Sha since year 2000 and continues to serve the divine mission.Master Sha’s concept of Universal Service touched her heart so deeply that she made a commitment to follow his teachings. Among her many certifications, she has also received a Divine Order as the ‘Universal Love Messenger.’ She made a vow to the Divine that she would dedicate all her lifetimes to serve and bring divine love and light to all humanity and all souls in the universe. 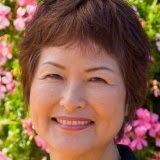 She serves as a board member of Sha Research Foundation and a worldwide Representative of Master Sha. Her goal is to help people awaken their soul power within them to heal and transform their lives. She offers powerful soul healings and the soul teachings through workshops, retreats and private consultations.